Cover image of Heart and Soul from the website of Eso Won Books. 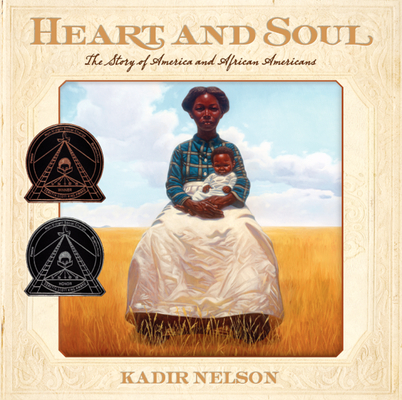 In celebration of African American History Month, I present you with an opportunity to support black owned businesses and a review of a U.S. History book for children entitled: Heart and Soul- The Story of America and African Americans by Kadir Nelson. For me, genealogy is the history of all of the people not just the rich and famous. Each of these individual stories must be aggregated to have a comprehensive understanding of U.S. history. Mr. Nelson seems to agree by telling the "Story of America" through the eyes of a one-hundred year old African American woman whose family history is closely tied to the history of America. The author uses the voices of people from his own family history like his grandmother, his mother, his aunts and uncles to create his narrator. Mr. Nelson "wanted to hear the story of America as if it were just that, a story, so the narrator speaks to readers as if she were their grandmother. It makes this incredibly expansive history very intimate...I first thought of my own family and began interviewing some to the eldest members who had lived through key moments in history. I heard stories about the last slaves in my family and my great-great-grandmother who was a member of the Seminole Nation...Through the memories of my elders, the American story unfolded right before my eyes"
I emphatically agree with the author's statement! I found his approach to be inspirational to me as a genealogist and a family story teller. We are an independent African-American bookstore in Los Angeles, California and have been serving this community since 1987. We carry an enormous collection of titles by and about the world in which black people exist. When you're in the Los Angeles area be sure you stop by. If you can't make it to the city we are more than happy to meet your book needs online. We were immediately drawn to the children's section of Eso Won and found an abundance of titles appropriate for young readers including Heart and Soul by Kadir Nelson. Mr. Nelson is both the writer and the illustrator of this award winning book. One of his biggest challenges in producing this paperback was the sheer number of paintings that he had to create to tell the story. The final tally was almost fifty paintings. Chapter1 is entitled: Declarations of Independence and it begins by describing the artwork in the U.S Capitol. "The paintings tell the story of how America came to be. Strange though . . . nary a black face in all those pretty pictures. There's plenty of white folks and a few Indians here and there, but none of us. It's as if we never existed--stricken from the record, like Moses from the walls of Egypt. Of course, those fancy paintings ain't telling the truth." Reading this book to yourself or your children or your grandchildren is an excellent way to begin to fill in the voids of our collective history of America which can be called the American "Ancestor Puzzle." Clearly we are missing many of the pieces of the puzzle which we need to give us a complete rendering of the true image. The artwork and the stories in this book need to be added to the American historical iconography. "You may have heard folks say that black people invented shoes. But, chile, that is not true. Everybody invented shoes. But it is true that in the 1880s a black man named Ernst Matzeliger invented a machine that made the process of making shoes a lot cheaper and faster. Matzeliger is one of many black folks whose ideas have made the lives of everyone in the world a lot better...Have you ever used an ironing board? Sat in a folding chair? Used a dustpan? Ridden in a convertible or on a horse saddle? Read an almanac? Used a fountain pen that did not require dipping into an inkwell? Sat at a traffic light? Seen a gas mask? Used a golf tee? Turned on an electric lightbulb? Eaten food delivered by a truck? Used an ice cream scooper? Gone to a blood bank? Used a batting helmet or shin guards, or enjoyed potato chips? I'll bet you have. Most people don't know that all of these thing were invented by or improved by black folks." I hope that this book is an inspiration to parents and children to explore the lives of these Black Innovators in greater depth. This chapter on innovation will help you to learn the origin of the term the "real McCoy." The artwork of Kadir Nelson is available for sale at Hearne Fine Art Gallery at the following link: http://www.hearnefineart.com/kadir-nelson which is the source of this image. The website of Kadir Nelson has dozens more of his iconic images: http://www.kadirnelson.com/gallery which are also available for purchase. The book is a bargain at $8.99, supports the Common Core State Standards and is highly recommended to my readers.